Mustn’t grumble – was the oft repeated cry of the pre-war Brit; all stoicism and stiff upper lip. Then the post war baby boomers became £10 poms and acquired the reputation for whinging. Well clearly I was part of that post war boom. Mustn’t grumble? You must be expletive deleted joking! I spent the morning clearing junk out of my garage. 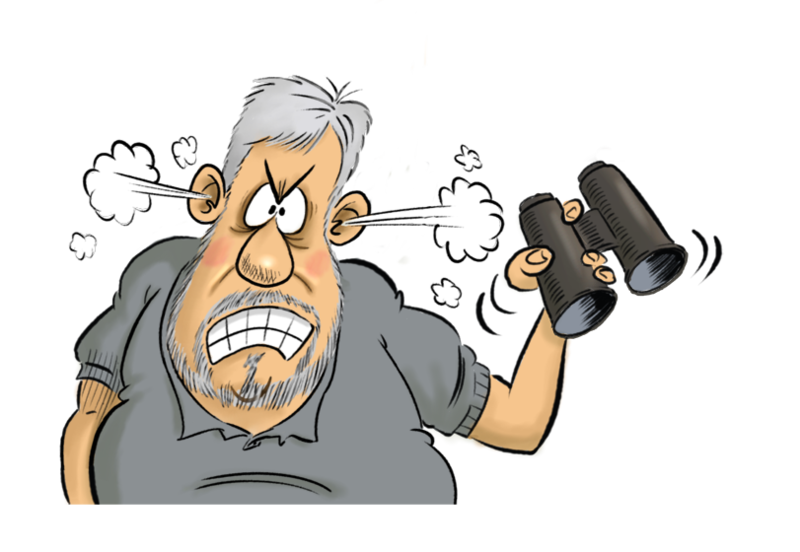 What, I hear you whine, has that got to do with birding? Nothing! Absolutely, another deleted expletive, nothing. That’s the point, I cleared out my garage when I should have been enjoying [well eating anyway] an airline breakfast as we prepared to land in San Paulo. Illness in the family meant I had to cancel my trip to the Mato Grosso at the eleventh hour… a month of Antwrens and Aracari, Toucans and Tody-wrens has been replaced by domestic duties and more slaving over a hot computer. Mustn’t grumble? Do me an expletive deleted favour! I have spent months drooling over pictures of Blond Woodpeckers, slavering at the sight of sought-after Antwrens and gibbering over Jabiru. By trawling the net, calling in favours and cajoling friends I had managed to get a book and a half, a bird family CD-ROM and several hundred images downloaded onto the PC in an attempt to commit to memory at least the main families of South American avifauna that I have never encountered. You see, and here is the beef [in an American political sense as well as a whinging pom one] – there is no decent field guide to the birds of Brazil. There is but one stray ray of sunshine in my otherwise dark and gloomy world – this lack of a field guide is going to make it slightly harder for anyone else new to Brazil to identify what they see. Of course, anyone in their right mind when visiting a new country in a new continent where no fieldguide exists, would be accompanied throughout by a local guide. Unluckily I engaged not one but several such fellows when planning my month long sojourn in southeaster Brazil… I say unluckily as my misery is not just that I am sweeping the garage floor rather than scanning the jungle floor; it is more poignant; more exquisitely painful for the fact that my oldest and dearest friend is, right now, sipping some South America beer whilst acclimatising in a hotel in Cuiaba [Gateway to the Mato Grosso] and trying to familiarise himself with whatever birds hop out of the foliage. What possessed me to invite him in the first place? In the name of all that is holy I must have taken leave of my senses; damn it all, the expletive deleted bloke is already nearly 100 birds ahead of me on his world list… I languish in the 1900s whilst he has already stepped into the glory of a 2000+ man! The only reason I invited him along was because his previous visit to Costa Rica meant that he was guarantied to see less lifers than me on this trip. And what did I do when I told him yesterday that he was to be deprived of my company? I wished him luck! I think he could tell, even over the telephone, that my teeth were firmly clenched if course. Of course he will not be alone… his younger brother is with him. Now, were I a right thinking and generous cove, I would be relieved that the man whose friendship I have valued for over 40 years will not be alone as he steps forth into the land of Anacondas and aggressive spiders, teenage gun gangs and man-eating mosquitoes. But this callow youth [is 55 still young] who tagged along with us big boys [we were, after all, a good 10 months older than he] decided to go to Brazil and try birding for the first time in his life. Avuncular advocates of the gentle and noble pastime we all share would no doubt purr appreciatively and cluck encouragement to anyone stepping up to the plate for the first time clutching their bins in an unfamiliar grip to ask “what sort’s that then; the red, yellow and blue one that looks like a parrot?” I ask you, is that fair? Should this novice stripling see Jacamars and Jabirus, Screamers and Ant-pittas by the score whilst his elder and better will be lucky to add a Bean Goose to his year list? Of course he will have to rely on his older brother’s skill and the pointing digit of one of the worlds top birding guides to tell him what he has seen as Brazil still has no comprehensive modern fieldguide to help him decide for himself. It is truly remarkable that I have managed, over the years to visit no less than four different countries the year before a decent filed guide was published for each… I have had to struggle with the incomplete or the incomprehensibly ordered or the uselessly monochrome. I have tried to make up my mind whether the bulbul was grey-hooded or grey-headed simply by reading about its call in a pictureless guide when the bird was as silent as a grey-cowled Carmelite. To bring some glimmer of light into an otherwise dark and sad world I set off to Potters Bar rather than the Pantanal on the first twitch I’ve attempted in ages and managed to connect with the obliging Gray-cheeked Thrush… small compensation I know but at least I’ve managed a lifer this month – my friends emailed me to say he had added around 250 and he is only halfway through his stay! With my oldest friend gripping me off and the fieldguide still unpublished is it any wonder I’m a grumpy old birder?